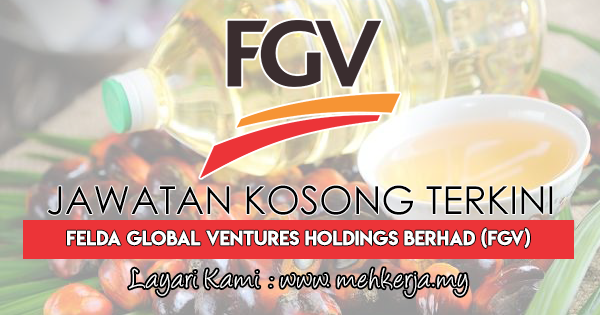 Felda Global Ventures Holdings Berhad (FGV) spearheads the Felda Group’s business transformation into an integrated multinational corporation, focusing on the agri-business sector. FGV is investing in diverse activities such as multi-crop plantations, oils & fats, oleochemicals, logistics and services throughout the world. Today, Felda Global Ventures Holdings Berhad ranks among the top 25 companies on Bursa Malaysia with a market capitalization of RM16.6 billion. Felda Global Ventures Holdings Berhad employs close to 19,000 people in some 44 subsidiaries in over ten countries. 0 Response to "Jawatan Kosong Terkini di Felda Global Ventures Holdings Berhad (FGV) - 25 Aug 2018"